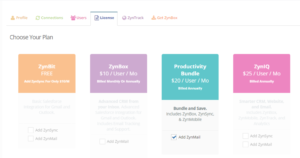 When purchasing ZynBit, there are different considerations for organizations and individuals. Are you purchasing a personal ZynBit subscription or one for your enterprise? If personal, skip to item number 2. 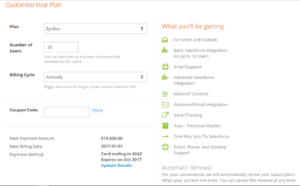 If you are purchasing a group (enterprise) subscription, think about the following items. The person who is logged into app.zynbit.com and checks out becomes the administrator of ZynBit for their company. This individual can select the license type and manage the users paid for by the company. Are you able to make the credit card purchase for the subscription? If so, skip to item 2. If you are not the card holder but you ARE the ZynBit Champion – locate the card holder and or call/chat ZynBit Support to make sure you are set as the administrator and the right credit card is used. Need some help? We are here for you. Call us at 1-855-GETZYN1 or lets live Chat.